“Intuition, prescient sight, higher knowledge, receptivity, the ability to work with subtle energies of Spirit and the psychic power of the feminine – these are the aspects of the High Priestess of Avalon. When The High Priestess appears before you, she asks you to trust your intuition and to throw the net of your awareness out into the world around you, pulling in truths that may defy your intellect, rational mind, or what others wish to falsely or superficially portray. Go beyond the ordinary, past the chaos of the modern life, and trust your inner vision to guide you on your path. Pay attention to your dreams, and keep track of your intuitive hunches for when The High Priestess appears, she asks you to look for the thread of truth in these places. Be discerning in all that you do at this time, for The High Priestess reminds you you that not all is as it seems to be. However, do not take this personally – rise above it and ask for a true vision to see the path ahead. You will be given this vision to see the path ahead. You will be given this vision. All you need to do is ask the God or Goddess and be open to receiving it. 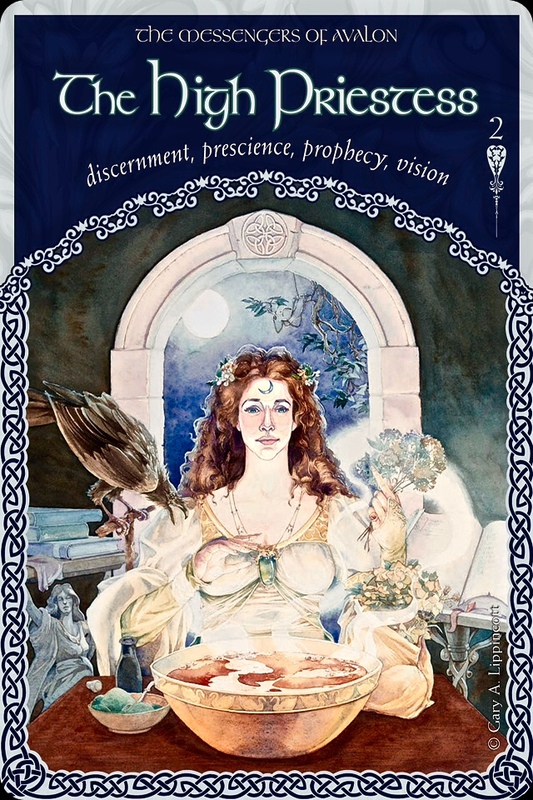 The High Priestess Of Avalon is the well of Divine Feminine Wisdom within us. She is our connection to the esoteric; the mystery and the magic of the Universe. She is Healer and Mother and Shaman; she is Wise Woman, Lover, Teacher and Guide. She is a part of me and she is a part of you. We need our connection to her to be strong, we need to be able to express ourselves in the many awe inspiring roles of our ancient female ancestors. Without fear. Without shame. With confidence and conviction; strength and devotion to our Mother Gaia and the Universe. Connect to The High Priestess Of Avalon through ceremony and ritual. Through the forest, the plants and their healing properties; the trees, the moon and stars; and the cycles of our beautiful planet. Connect with her through crystals and candles and your familiar, or spirit animals. Connect to her through silent contemplation; through bare feet on the earth and palms to the sky; through beautiful music and wild dance and blazing fire; through whispering air and reflections in water. For she is there in all of these sacred elements. And so is a part of you.